Emergency preparedness is always important to be working on. You never know when something awful could happen which could render you helpless after a blackout, a flooded home or any disaster for that matter. Being prepared for such a time can sometimes be overwhelming to think about, but regardless of that it is still very important. I think this little trick is really neat and could really be useful if you have just a few of these household items on hand (which I think most houses would). 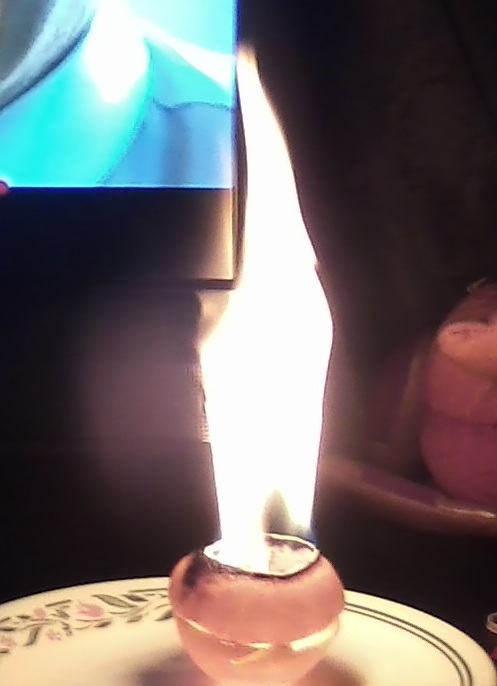 A super awesome candle made out of an orange, and some cooking oil. The original site says to use an orange removing the peel from the flesh of the fruit, and then adding a little oil to the bottom of the peel "bowl", ( it can be any kind of oil example: olive, veggie, canola etc.). 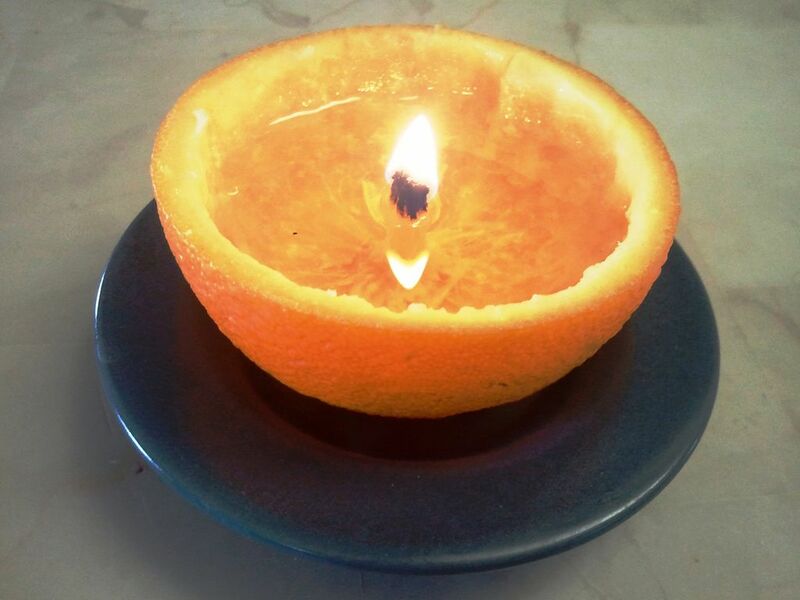 You then light the orange peel stem (that comes from inside the orange) and that becomes your wick. They then cut the center out of the other half of the orange and used it at a "lid". Ashley tried out this pin, following all the directions and using veggie oil, and here is her Pinstrosity. After reading the directions and not seeing really anything that Ashley did wrong, there is one thing I can think of. On the comments from the Instructables page about this, someone mentioned that you really need to make sure that there aren't remnants of the white part that grows between the orange flesh and the peel left on the peel. Addendum: If the hole in your lid is too small, oxygen can't get in and your fire will go out, if your hole is too big however there is too much oxygen and therefore lots of fuel, which produces a larger flame. As seen above. One way to avoid this problem is to not put a lid on it. With that being said it might be smart to put this one on a glass plate like Ashley did above, or put it in a bowl, or a candle holder that has sides. I must also do my mandatory safety speech, never leave this lit while you are not home, not attentive to the fire, or in reach of children or animals. Fire is hot, the orange will probably get hot and the oil is definitely really hot. Please take caution when doing this. Happy Friday Pinstrosipeeps! Have a great weekend, and stay tuned for Marquette's post tomorrow! I know, I already posted today...but there's just so many great Christmas submissions and Christmas is coming up fast, so I'll be squeezing extras in to help give you ideas, to troubleshoot projects, and to just give you a holiday chuckle. Everyone has their own Christmas decorating style. Some are into Santas, some Nativity Scenes, some snowmen, etc. Me? I love Christmas trees. If I could I'd have a forest of real trees and decorate them all, but that's not really feasible, so I'm slowly making and collecting Christmas Trees for my decorations. My Christmas Pinterest board is full of Christmas Tree ideas just waiting to get done. I love people's creativity! That's so fantastic. 6 High School students were working on decorating their school's library for Christmas and found this idea and went to town with the project. 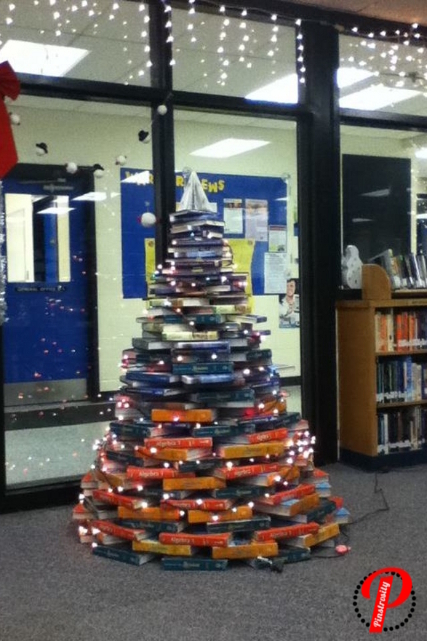 I love that they wrapped lights around the book tree, it's a fun spin off the original idea. This project definitely takes a TON of books. I think most of us would underestimate how many books this takes. As an avid block player (I still like to see how tall of a tower I can make), I have a small idea...but I'm still sure I would underestimate the numbers. As the picture shows and as Ashley stated, they ran out of the orange and green books they were using and had to switch things up, changing the look of the tree. True, the tree would have looked a mite better if the same color scheme had been able to be continued up to the top, but it's not bad. It would have been more time and work, but I know my high school had the big rolls of colored paper...if they wanted a uniform color they could have covered all the books with the paper. And then, it's hard to find small enough books to get the tree to come to a point. There just aren't many tiny books any more. My guess would be that children's sections would have smaller books, but most high school libraries don't have a children's section I'd imagine. All in all though, I say bravo to this group of students for taking on the project and adapting it to make it work! Also, a huge thank you to the librarian who let the kids work together, brainstorm, adapt, and figure out how to build this. What a great project! 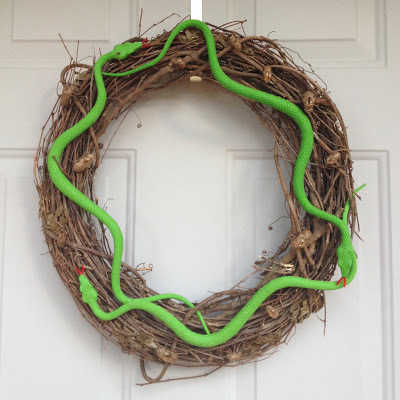 Did you catch Emilee's creepy wreath post yesterday? I so want to make that now and hang it on someone's door for next year. Continuing with the wreath ideas (because wreaths are in huge right now) I have a double Pinstrosity post for you. Today, I give you...the ornament wreath. I'm not sure if I'd hang that up during Christmas or Easter, but they did a good job with it either way. Gretchen saw it and decided to make one of her own. She said, "Here's my attempt at the Wire Hanger Wreath by Eddie Ross. I think it's a pretty good attempt, though I made it harder on myself than it needed to be...". I don't know about you, but I'm an expert and making something harder than it has to be. And after reading Gretchen's story, I'm pretty sure I would have taken her exact route too. And now you're probably doing what I did..."That looks great! That's not a Pinstrosity." But Gretchen has some great do's and don'ts to give all of us from her experience. "After happening across this project on Pinterest, I figured it would be pretty easy, and I immediate rushed out and bought a large container of shatter-proof ornaments - I 'guestimated' how many I would actually need. And thankfully, I had ONE wire hanger in the house (Joan Crawford would have loved me!)." "Now, even though the directions clearly said to hot glue each cap onto the ornament to assure they would stay attached during stringing, I decided to forgo this step - mostly b/c I couldn't find my glue gun, and I didn't want to buy another one. I've probably got three hot glue guns in the house, and couldn't find a single one of them; I was being just stubborn in not buying another. This would come back to bite me in the rear a bit, but I pushed on." "After untwisting the hanger, I started stringing the ornaments in what I hoped was a random pattern. Unfortunately, there were more red ornaments than green or white by about 2:1, so the red turned out a bit more prevalent than I wanted. My wreath looked WAY too angry! I ended up unstringing all the balls and using some extra ornaments I had that were silver-toned in an effort to break up the red. I was somewhat satisfied, but in the future, I'd probably use a lot more random colors/designs like in the original." "Once I got all the ornaments on the wire, I had to cut off the end of the wire - it was way too long. I didn't realize that even though I got a big container of ornaments, b/c of the way they're bunched together, they actually don't go very far in the project." 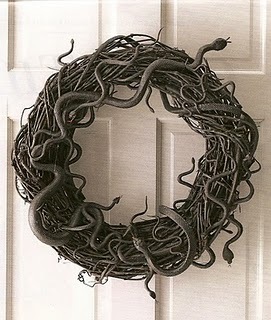 "The tricky part came when it was time to close the wreath. When I tried to bend the wreath into a circle, the ornaments were really tight together - a necessary evil because otherwise you would see the wire. I ended up using needle-nose pliers to bend the ends of the wire into two hooks, then carefully clasped them together. This was the hardest part because the tighter the circle got, the ornaments kept popping off - remember that glue gun I was too stubborn to buy? But eventually, I got the ends to close, and moved the ornaments around so no wire showed through." "Not a bad first attempt, but in the future: GLUE THE CAPS, buy ornaments of one color or lots of random colors, and get more ornaments than you think you'll need. Otherwise, pretty easy project!" So there you have it. Make it easy on yourself and take the time to hot glue those caps. Seems so simple that it wouldn't be necessary, but those are always the clincher steps. I cannot find the original owner/creator of this photo. All I can find is that it was uploaded to Pinterest by someone...but spent an hour following chains only to get to dead ends and never found who uploaded this online. If you know, please let us know, we'd love to give them credit! Combining two popular decorating fads in one craft...wreaths and monograms. Way to go ingenious person! Krista saw this and actually did a great job recreating it, but she also ran into a few problems and gives some good pointers on what to do in the future. She says, "Had fun making this with my mom! There were a few problems we ran into. We should've started by cutting the green styrofoam ring in half so it wouldn't have been as thick. Also, we should've wrapped black ribbon around the ring before we started hot gluing the ornaments. The ribbon would've helped hide the green styrofoam. I wanted to use blue ornaments so I feel like mine looks a little more like it belongs in whoville, but either way I still like it!" So neither wreath is a catastrophe, but we thought these ladies tips would be highly appreciated as all of us are now getting our Christmas workshops going. Thanks Gretchen and Krista for sharing your photos and great tips! Happy wreathing everyone. Leave it to Martha right? Not quite the same eh? Now, I will say I still like it, it's Halloweeny AND Susanna added nasty creepy Cicada skins, which is well in a word awesome. She said she didn't paint it because it was late at night and she ended up really liking the look of ht green snakes, and I think that's cool too! However there are a few more things that attributed to this not turning out like Susanna had planned. "... I had trouble finding large plastic snakes. I was able to find small ones at Dollar Tree, and I finally found the large ones at Wal-Mart in the toy section. 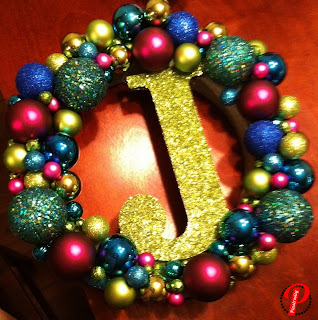 The wreath and the spray paint that's supposed to adhere to plastic (which I didn't use) are from Hobby Lobby. I bought five snakes, but only ended up using three because my boys wanted to play with the other two, and I didn't have the heart to take them away." Cameron and I usually do a dinner for the Autumnal Equinox each year, but we missed it this year as I was at a wedding and he was out lizard hunting (yes, you read that right...life of a zoology major). I didn't think it'd matter much, but I kinda missed putting together a fun and fancy meal (well...fancy for us...). I decided yesterday that I'd put together a Fall Feast to make up for missing the Equinox dinner, so I pulled up my Pinterest boards devoted to food, tried to find ones I already had the ingredients on hand for, made a plan and got testing these tasty looking food pins. As I was cooking though, I realized I was making way more food than Cameron and I could eat so we called Em and Chip to come over and we feasted together on the Pinterest found meal. I pulled a few recipes from our own files, but I tried many new ones this time. I figured I'd share how they turned out, what worked, what didn't, and what I would do (and did do) differently. So there's the set up. I love my dishes, they are just so happy looking. Mine came out a little more yellowy orange instead of orangey red...but the tomatoes I canned last year weren't very red...so I'm attributing it to that. I was excited to get a chance to use my canned tomatoes. Last year was my first year canning, so I'm still a little excited to be using these tomatoes. Anyway...this tasted fantastic. I loved it. Cameron's not huge with tomato soups, but he said this one isn't bad (here's the secret...there's bacon in it and the veggies are sauteed in bacon fat for 8 minutes...man pleasing right there). I did have to tweak this one due to the ingredients I had on hand (I don't live where just running to the store is an option), but I think it came out decently similar to what it would have had I had all the ingredients. First, I didn't have carrots...so no carrots in this soup. Second...I just had normal onions on hand...no spanish onions. Third, my herbs were dried, not fresh...so I just sprinkled them in and left them in (minus the bay leaf, I took that out). Fourth, I had half and half in the fridge, not heavy cream. So I know those made some difference, but I don't think they completely altered how this turned out. I would definitely like to try it 100% true to the recipe, but even with these tweaks, this turned out delicious and was easy to make. My biggest disappointment? The bacon crisps I had ready for the end didn't float on top of the soup, they sunk to the bottom...so they just ended up being a part of the soup and not a garnish...but that's not really anything to complain about. Let me tell you, this was delicious. I did tweak it, but it was still delicious. Was mine anywhere near as pretty as that. Bahahahahaha, no. It's a good thing food doesn't have to be beautiful to taste good. Don't get scared off by that picture though, it was delicious. And again...it has bacon in it and the last step before baking this is to glaze it with bacon grease. Another man pleaser (then men did love it, btw). I actually followed the directions decently here, just adding my own twist at the beginning. The recipe doesn't call for the turkey to be marinated, but I did it anyway. I tenderized the turkey breasts, then added them to a bowl with some olive oil, coriander (whole and ground/roasted), garlic powder, onion powder, paprika, and sage and let it marinate for 1 1/2 hours. For the filling, the only deviations I did was using plain boring canned mushrooms rather than porcini mushrooms, I didn't have shallots so I used onion, and the cranberries were omitted entirely. Other than that I followed the recipe and directions to the best of my ability. This turned out so incredibly tasty and moist. We could cut it with our forks it was so tender. This is a huge win in my books, I'll definitely be making this again. I raided Cameron's cooking boards for this one actually. Good choice hunny! Poor cam was late getting home and he was bringing the taters, so we sped through making this as much as we could...so we cut out the baking part. But it still tasted great. Our main substitution: we didn't have buttermilk so I used half and half. I know...it would have tasted better with buttermilk, but it wasn't bad at all with the half and half. 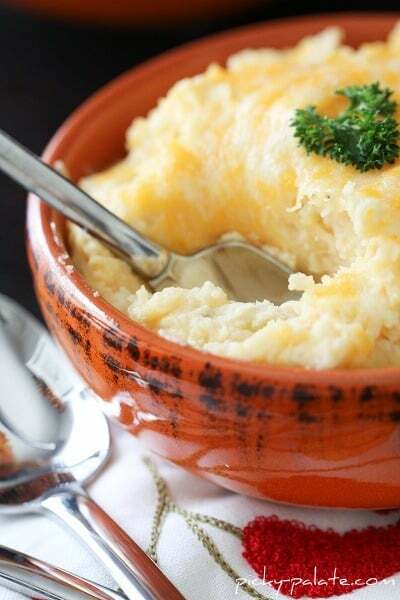 I loved how creamy these potatoes were with the cream cheese in them. MMMmmmm. Then we did add a small dribble of liquid smoke to get a more smoky flavor. Easy and yummy! And what is a good meal without some sort of bread?! I've made these quite a few times actually, and they turn out good every time. Well...the didn't turn out the one time my house was too cold for the dough to rise...but every other time they turned out great. They are so quick and easy (2 1/2 hrs from start, through rising time, to finished and in your belly), and they taste great. Don't get scared off by the fact that you make oatmeal, then turn it into rolls. These are great, give them a try. I have no idea what happened to that roll on the left...it looks like a hand with a finger pointing at me or something. Tasted good though. so I found a recipe on my boards for Prickly Pear Juice. I ended up just using the recipe as a basis though and made my own deal instead. 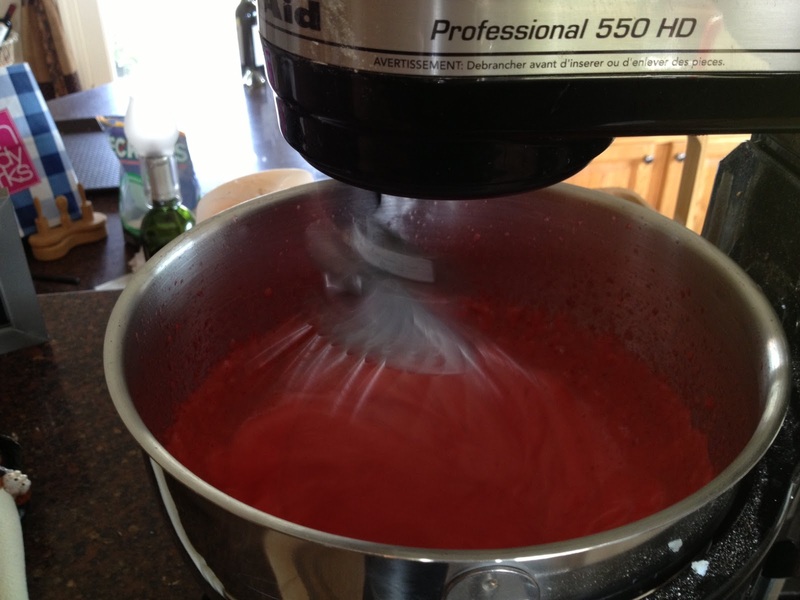 I ended up with a Pin Spin, making Prickly Pear Raspberry Lemonade instead. Like our fancy glasses? Got them at the Dollar Tree for a buck. Love great deals like that, and they class up a meal so fast when we want to "fancy". I'd actually made this pie twice before. Once was an overwhelming success...the other time, not so good. I found out for this recipe, using real pumpkin is key. The first time I made this I bought a pumpkin, cooked it, and used the pumpkin goop to make the pie. It was sooo tasty. The second time I bought canned pumpkin pie filling...not so tasty. In fact, it went uneaten for the most part and I chucked the remains today. Lesson learned...use real pumpkin. It's so worth it! This time...the taste was great, but I tried making individual servings rather than a whole pie and that didn't go quite like I thought it would. These tasted great (again, not pretty, but ignore that), but they weren't quite firm enough and were hard to eat out of the paper cups. I should have just left it as a pie. Oh well. Live and Learn. I've had these pinned for forever. Cameron loves lemon bars, so I thought I'd try these out and see what he thought. They were scrumptious, but boy were they crumbly! I mixed the crust/topping up and it just seemed too dry, so I added 2 additional tablespoons of butter. It still seemed dry, but I didn't want to add too much...for all I knew maybe it was supposed to be really dry. I'd never made these before, so I had no clue what I was looking for. I mixed the "filling" and poured it in, then sprinkled on the topping and popped it in the oven. When the timer yelled at me (mine is an excruciating whine...it was definitely designed so that it could not be ignored) I opened the oven and the crust didn't look like it'd changed at all, so I left it in longer. 10 min later there was still no change, but I didn't want to overdo anything so I pulled them out. They were super tasty, but they were so incredibly crumbly. I think next time I'll keep adding butter until the crust/topping consistency is more tacky and less dry. But they were scrumptious and Cameron heartily approved of them. So there's a few yummy pins all tested for you guys. I'd make any of them again, they were fantastic and made for a fun meal. Thanks for sharing it with us Em and Chip! So this little decor didn't start out as a Pinstrosity, but it certainly ended up that way...Check it out! 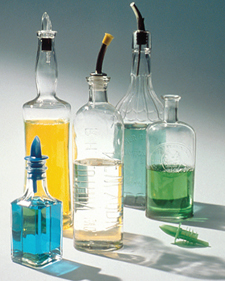 Martha Stewart Living shows a cute way to store dish soap, not so tacky in the original packaging eh? A fun way to store a kitchen necessity! The problem, either the soap is too thick, or the metal top rusted, but there is no soap coming out! 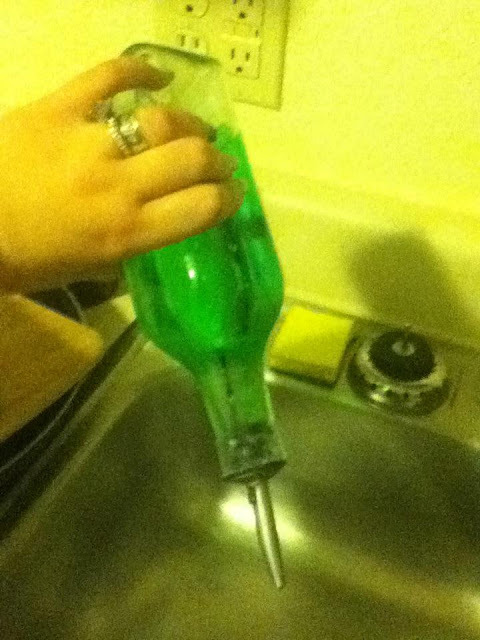 At one point I shook the bottle hard upside down and then angrily put it back on top of the sink, then an awful air sucking noise came out and a huge chunk of dried soap popped out the top. I think that the soap is too thick, and gets stuck in the top and dries, so then nothing comes out. So For future reference, this type of container is no good. Try one f the olive oil containers that has a removable lid of some sort to save yourself the trouble. I would like to add that I am using Dawn Dish Soap, I am not sure if just this soap is too thick or if most soaps will do this, but I thought it was worth mentioning! All the more reason to NOT do dishes right? Anyone else still recovering from Thanksgiving? Yeah, me too. And I even was careful not to over-stuff myself. It probably didn't help that I went to a wedding yesterday with a buffet of pasta and Chicken Parmesan from one of the best chef's in town. Happy tummy. Weddings send me home in a lovey dovey mood, I just love them. So what better way to continue that than a cute couples photo Pinstrosity this morning? I like that plan. Couples wrapped in lights, babies wrapped in lights, kids wrapping their parents in lights, etc. It's a cute idea that went viral last Christmas. 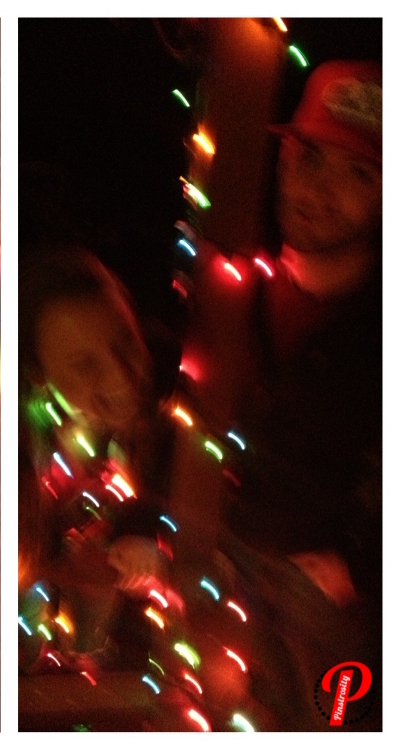 Looks so easy...wrap up in Christmas lights, take a picture...but as Blair found out...it's not quite that simple. Blair said, "My husband and I wanted a cute pic for our first Christmas card. I found this adorable idea on Pinterest and decided to try it out... It didn't go so well. We used an iPhone to take the pic because my digital camera kept blurring the lights. Also, half of the lights were already nailed to the house for decoration and I just tried using what was still hanging loose. 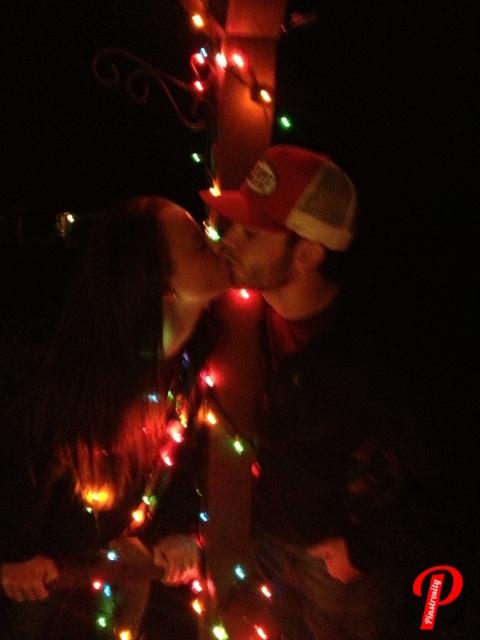 We had just small lights and the couple in the picture had the big ones. Anyways, here is our epic fail. At least we had some good laughs." Don't shoot at full-on-night darkness. I know...that seems counter-intuitive because don't you need darkness for the Christmas lights to shine? Not completely. Take a look at the original pin photo. The sky is still a little light. Try taking these in the evening just after the last sliver of sun has gone down, or even a shady side of a building during the day. How does this help? Your camera won't have to take such a long exposure if there is more light. The longer the exposure on the camera, the more chance there is of blurring in the picture. That's one thing that happened with Blair's photos. The movement of Blair and her husband and the lights blurred the image. If you are shooting in low light conditions, try to shine a lamp or some form of light at least on your faces. If you're outside, park your car a little ways away and turn on the headlights. If you are shooting in low light conditions, see if you can find access to a higher end camera (or a friend who'll come with their higher end camera). For the most part, iphones and low end point and shoots won't do so hot in low light; you often end up with a grainy look (called digital noise) and color distortions as the camera tries to compensate for the lack of light. Some point and shoots will do fine, but not all. Just be sure to test your camera out before getting tangled up in the lights so you know what you'll need as far as light goes. While this can definitely be done with just two people and a timer or remote, grabbing a third person to help run the camera will be highly helpful. This way you don't have to set the timer, push the button, run tangle up in the lights and hold the pose in time for the picture. It'll make the whole process more smooth, quick, and fun. Even if you have a third person, set the camera on a tripod (or the counter, or a stump, or the fence, or somewhere stable where it will not move). This will also help to minimize any blurring. If you are shooting at night (or dusk), and even if you have a third person, set the camera's timer. This way your third person can push the shutter button and then let go so they are sure not to be moving the camera at all while it is taking the picture. You'd be surprised just how much your hand can move the camera by just pushing down the shutter button. I love seeing what people come up with for Christmas cards. I love the classy photos, the funny photos, the "whoops" photos, and the clever photos. It's just fun. I'm excited to get ours finished up so we can send them out! I guess I better go get working on those. Catch ya on Tuesday! Have a great rest of your Holiday weekend! Happy Thanksgiving! I hope your family is all well, your turkey's cookin' up scrumptious, and your pies are perfect. Ok....let's keep it realistic...I hope there's not too many arguments, that the stuffing doesn't all fall out of your turkey and that your pies don't get too burned. Or maybe that's just my house, lol. But really, I hope it's a wonderful day for everyone. I think it is wonderful and awe-inspiring that we have a whole day where the nation comes together in thanks. I've got my double decker pumpkin pie done and in the fridge, next up...the yams. I thought I'd give you a roundup of the last of our Thanksgiving Pinstrosities sent in to us (and we'll even pull up a few from the archives, because they're just good). I won't go into depth today in how to fix each (don't want to get behind on the cooking schedule, lol) but we'll do what we can. 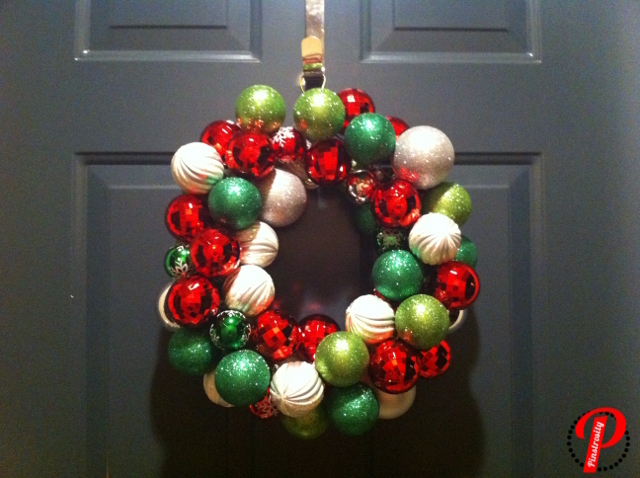 Nichole said, "I must say, I was at 100% when it came to Pinterest creations. Everything had either tasted yummy, looked good, or at least was something that I wouldn't feel bad about. Well, I was 100% with Pinterest until today. 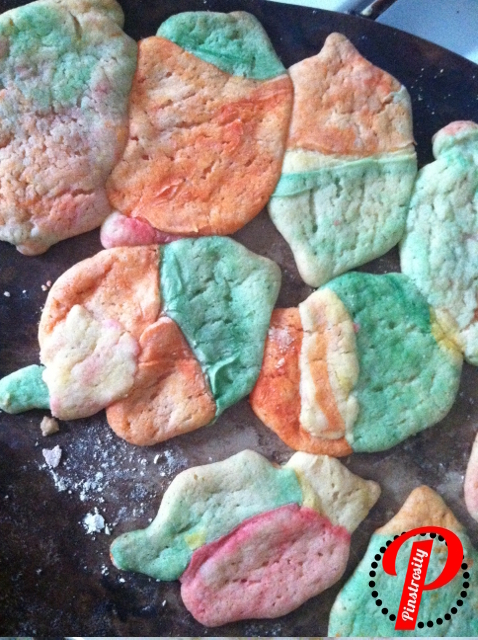 Today, I attempted the multi-colored leaves sugar cookie with a leaf cookie-cutter. The original pin looked easy enough. The description of the pin had the details written in it, add food coloring to parts of sugar cookie dough. Put strips of each dough color in an alternating arrangement and roll the dough flat. 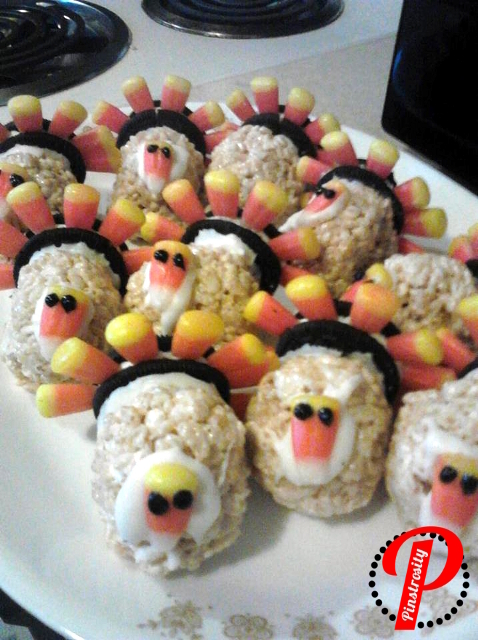 Cook and ta-da…the perfect fall treat! I followed these directions exactly. Things looked as expected, until the timer went off that they were done." "And this my friends, is what mine turned out like! The colors kind of lightened up. Also, for some reason the dough lost the leaf shape that I had given it.The good news is that my one year old likes them and doesn't care about the way they look :)"
Don't you love how so many cookie recipes show an unfinished product as their advertisement? Who knows how their cookies turned out, all there is on the site is the cut out dough pieces. Oh well. Cookies are finicky. You'd think you could just "make sugar cookies" and have it be fine, but there are so many variations between sugar cookie recipes that you can get such varied results. It looks like here a stiffer cookie dough is needed. These look like the soft and fluffy cookies I love, but to have a cookie that keeps it shape you'll probably need a more firm cookie in the end. 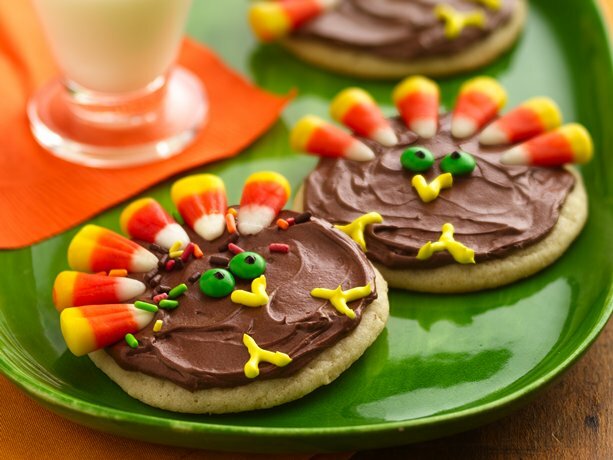 A shortbread or a stiffer sugar cookie recipe will work better with these. Calvin said, "Here at the information desk, part of our job is to decorate. 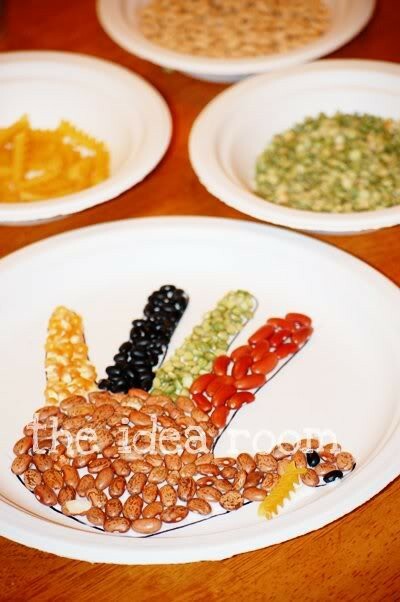 Searching for fall craft ideas, I stumbled upon this gem. A 3-D tree? That works perfectly! 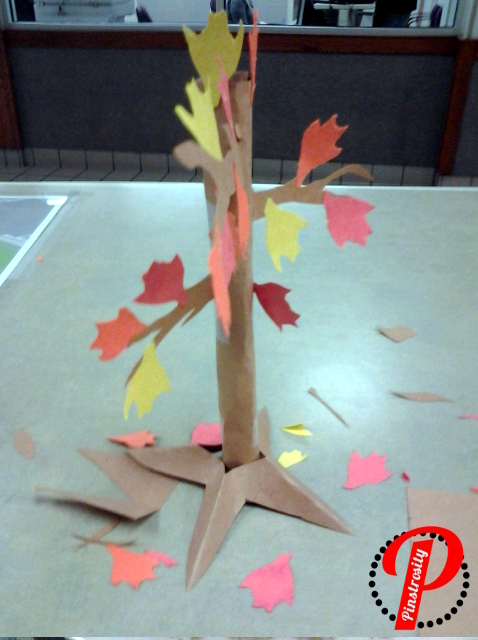 Of course, I lacked some all of the required materials, so scissors, tape, and four colors of craft paper had to do." Alrighty...Pinstrosity #3 coming right up. Oh man...I think I might test this one out...that looks scrumptious!! Michelle said, "In Minnesota, fall means many things - colorful leaves, cool weather, pumpkin patches and apple farms, and hot and hearty soups. I pinned a recipe for a delicious looking slow cooker potato soup way back in July and have been anxiously awaiting a brisk fall day to make it. And this is the soup." "I followed the directions exactly. I even went to 2 stores looking for Chicken Soup Base." "But as you can see, the cream cheese curdled immediately and floated around on top instead of ever mixing in with the potato chunks. It looked like someone vomited in my crock pot. 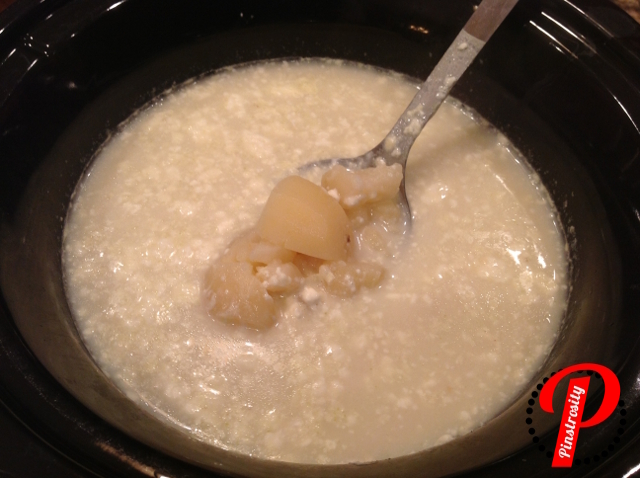 And speaking of the potatoes, I've made potato soup in the past where you semi-mash the potatoes after they're soft so the soup gets thick.This recipe didn't mention that, and so it basically turned into cubes of potatoes floating around in water and cottage cheesy cream cheese curds." "Needless to say, I had my husband stop and pick up some sushi for dinner. We threw the vomit down the sink." I'd imagine they left out the smash up the potato part when they typed up the recipe...but maybe not. I'll test that out when I make it (man...I have so many things I want to test and not enough time). This recipe just sounds so yummy (well, the original does...Michelles...not so much, lol). Stephanie said, "The pin is the darker, more put together looking picture...mine is the white body mess!!!" Now honestly, these aren't bad at all. I think it's one of those things where you can see all the flaws in the things you make but other people think it's fine. True, they aren't quite as tidy as the original, but not bad. Don't be too hard on yourself Stephanie! 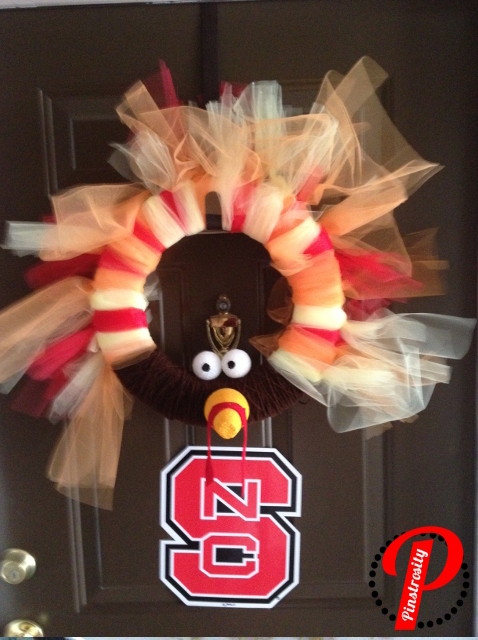 Buddy said, "So I saw this Turkey Wreath on Pinterest a few weeks back and thought that it was simple enough to make that it would be a great way to start off the holiday season. The original pinner had a bunch of different ones that celebrated various holidays. It looked simple enough right? Well the first problem I ran into was find enough tulle to do the wreath. Come to find out tulle is "not in season" or that's what the fabric department at my local fabric store told me. I ended up finding the 2 spools of the yellow and red at a local chain craft store (6" wide, 50 feet long). The orange however I luckily stumbled across at a different craft store, but had to cute it to size. The Styrofoam and yarn were simple." "The entire project took about as long as it took me to watch the Day After Tomorrow (I blame Hurricane Sandy for the choice in movie). The color of the nose was simply painted on using 2 parts sunny yellow to about 1 part pumpkin orange. Wrapping the yarn around the base for the turkey body was pretty tedious (and probably could be been substituted for brown fabric or wide ribbon). The knot that was suggested in the directions was equally as confusing, and I ended up just trading it for a basic knot. His feathers are a little, shall we say lack luster, but still gets the point across." It took me a second to realize the North Carolina State emblem wasn't hanging from his beak...I was a little confused at first. Anyway...I think the main issue here is the amount of tulle and it's placement. Now there's actually enough tulle tied on there...but the ends were left a little long. I think that if they were just trimmed up a little that'll help some. And then if the tulle was rotated a little more toward the front rather than the back or it would help the tulle look more puffed out and filled in. Other than that, it really isn't bad at all. And then...shall we bring up a couple Pinstrosity pictures from that past that fit in with Thanksgiving? I think we should. It still cracks me up, I love it. BAhahaha, I still LOVE this one. Well, that's it for today. Again, I hope your day is wonderful wherever you are. Life is what you make of it, so make it wonderful! Happy Thanksgiving! 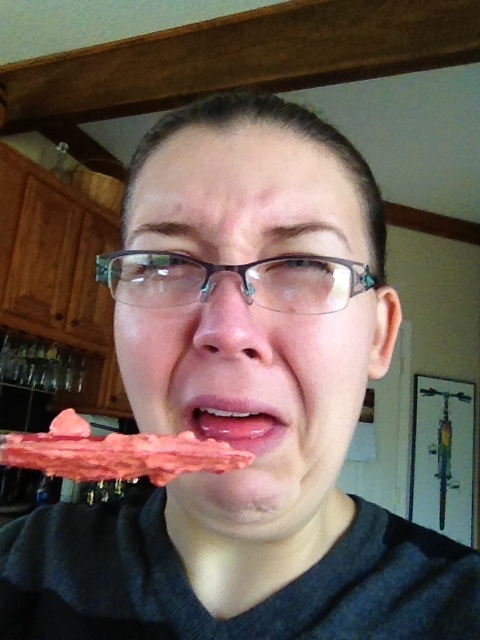 The original is a recipe for Jello frosting, with an option for sugar free, all the reviews were through the roof, and our submitter Sara didn't know what to make of it...she also says she followed to the recipe to a T, and still to no avail...let's here what she had to say about it all! "My mom made some oat bran cookies this morning that were all right, but they needed a little something-something to give them real umph. 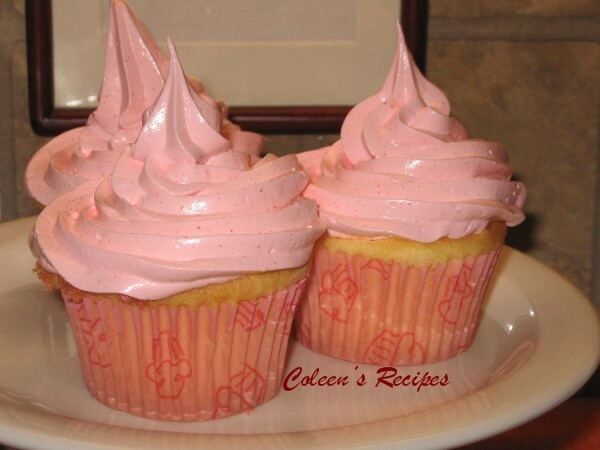 I remembered a pin I had run across recently for fat-free frosting made from Jello, and I thought it would be a great opportunity to give it a shot... I try to really limit sugar, so I was excited to find the sugar-free option that had good reviews. I followed the directions to the letter. It called for 3 ounces of Jello, which is an extremely large quantity of Jello (10 of the small packets), so I decided to make the executive decision to interpret that as 0.3 oz, which is 1 individual packet. I'm glad I did, because the flavor was overpoweringly strong just with that small amount. 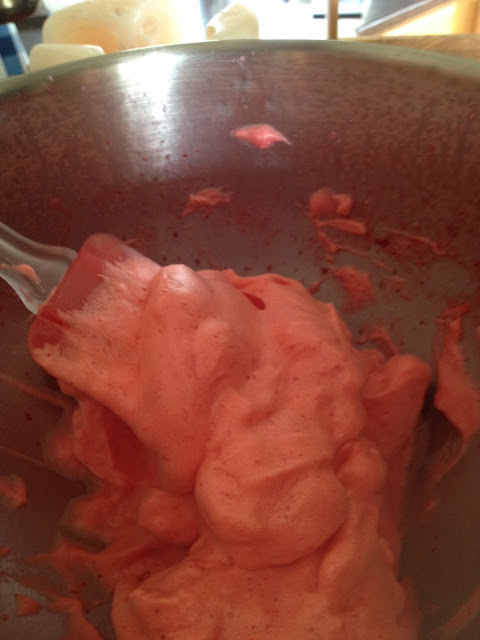 Attached is a during-shot of the substance in the stand mixer, and an after shot. Instead of an icing consistency, it formed a weirdly jiggly foam... Ok, odd consistency but still worth a try. I have also attached a picture that I think expresses the taste. It was absolutely horrible. I'm a Jello fan, I drink hot Jello camping all the time so I'm definitely not averse to the flavor (I used Black Cherry -- my absolute favorite! ), but this was simply the most awful, horrendous concoction that has ever come out of my kitchen. My dog wouldn't even eat it. For this reason, I would rate it as an "up in flames" failure. The comments on the blog post are glowing, so I don't know what went wrong. I will say that my frosting looked pretty much exactly like the sugar free version, but within a few minutes it had settled to the squishy consistency of poorly-frothed milk. It even smelled gross. I feel that the best utilization might be for a high school film class shooting a zombie movie that calls for homemade guts... 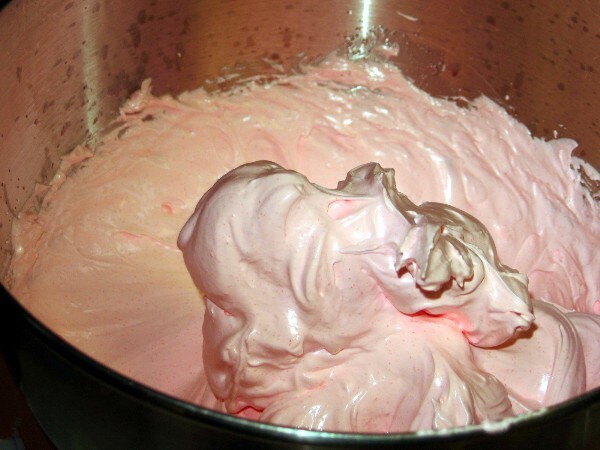 I won't be giving this one a shot again when there are so many other amazing frosting recipes in the world that don't smell like a frat house bathroom on Sunday morning." What I can gather, perhaps the sugar free has something to do with it, or the amount of Jello she used, I really can't tell! And even if I made it I wouldn't be able to give a helpful opionon because I really am not a Jello fan (go ahead hate me) ,so my opinion would be biased and therefore useless. Based on the reviews I see on the original site there were A LOT of people who really liked this recipe, so I am really at a loss here. It is now up to you Pinstrosipeeps! How can we help this kitchen disaster turn out right?! Anyone have awesome Jello frosting advice?! Jello Gods please speak to us!! Happy Wednesday Pinstrosipeeps! I hope you all have a Happy Festivities this week!